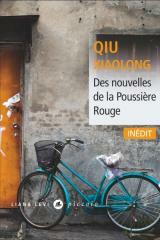 Qiu Xiaolong: from Inspector Chen to short stories. We have often spoken of Inspector Chen Cao, the hero of eight detective stories by the Sino-American writer Qiu Xiaolong. While in Paris before joining in Lyon the international festival “Quai du Polar” he could talk about the “Short stories of Red Dust” (Liana Levi, 2013) (1), the second collection which has just been published. The City of Red Dust is part of the former French Concession and is a group of traditional houses of old Shanghai, the Shikumen. These houses are built after 1900 with pink bricks and gray molded lintels; two floors and a small courtyard. They open on narrow streets, the Lilong, congested with electrical wires and drying laundry but also with people enjoying taking fresh air, drinking tea, bickering and talking. This is where Qiu Xiaolong joined his friends after school and listened to the stories and rumors; stories which will be at the origine of some of his short stories. The first volume was published in installments by the French “Le Monde” during the summer 2008, then in book form. With the second volume, a total of 42 years of the history of China after 1949 are discussed. For each year, the short story is preceded by a newsletter, written on a blackboard at the entrance to the city. This great idea allows to provide the reader with specific details on the history of this year and in the official style of the Party propaganda at the time. Inform in order to illustrate the short story, the small text that the author devotes to the events of that year. 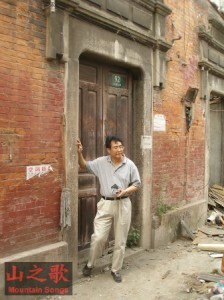 For Qiu Xiaolong, these short stories are his youth, his neighbourhood. He underlined that historical events, conversations, stories are an inspiration to a large part of Chinese literature. That is why he is quite happy that the first volume has been translated into Chinese and published in Hong Kong for the Chinese youth do not know their own history. The short stories will also be a source of inspiration for the poet Qiu Xiaolong. For him poetry is the important thing. It is for his thesis on the great Anglo-American poet TS Eliot that he left China for the United States in 1988 where he decided to stay after the massacre on Tiananmen Square. He has published numerous translations of his favorite poets, which can be found in a site where they are accompanied by stunning photographs. He has also released in 2008 “Lines around China”, a collection of his poems in English. * events he has known (the man who carried the statue of Mao which earned him a lot of trouble was one of his primary school teachers). Often a lot of humour: the fortune that represents a collection of Chairman Mao badges or in another short story, how “the herb bread”, that was eaten during the famine that followed the Great Leap Forward, became fashionable in some “trendy” restaurants. These three short stories show us how individual destinies are shaped by historical events, by chance but also by dreams that must be preserved to avoid sinking in materialism as currently in China. I note a certain ambiguity vis-à-vis the role of women. Qiu Xiaolong recognizes the work of liberation by Mao but stresses that the image of women during the Cultural Revolution was that of the “Woman of Steel” working, working as a man. The criticism is not only historical. Although he insisted on the role of the Party, the interests of which are paramount and which did set quotas of guilty citizens to be discovered (“Dictionary of Chinese Proverbs”). Now everything is for sale, the ideology is of no interest to anybody and businessmen from Taiwan buy young mistresses in Shanghai (Concubine, 2007). 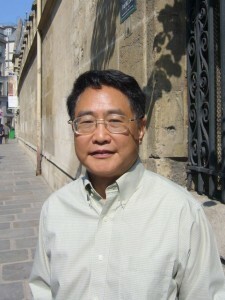 Qiu Xiaolong is very familiar with Chinese literature and we could talk about the authors he likes, Yu Hua, Yan Lianke or the Nobel prize for Mo Yan which had relatively little impact in the United States because only a few novels have been translated and insufficiently present in bookstores. Inspector Chen Cao meanwhile does not give up; the next book will be completed within six months. As we have already said, Qiu Xiaolong is very impressed with Bo Xilai. “If the system does not change in the future, other Bo Xilai will come again .. “. (1) These short stories were published in French in two volumes: “City of Red Dust”, translated from the American by Fanchita Gonzales Battle and ” Short stories from the Red Dust “, translated by Adelaide Pralon, to which one should add a small book”The good fortune of Mr. Ma “(for the years 1962 and 1982). These three books in paperback “Piccolo” with Liana Levi. 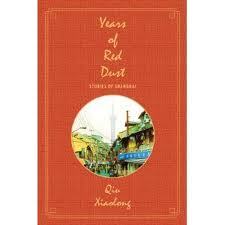 In English only the first volume has been published in september 2010 : “Years of Red Dust: Stories of Shanghai”; St Martin’s Press. Wu Ming-yi, a magician in the field of literature. Xue Yiwei, a writer famous in China and almost unknown in Montreal. For Xinran, generations of single children are not an asset for China.